05-29-2012: OKLAHOMA I never thought that I would have a chase day where I would see a tornado, but this would be overshadowed by the supercell structure itself. This was certainly one of those days! Our group of SLT crew and guests started out in Wichita Falls, TX and headed north, targeting an area between Woodward and Enid, OK. SPC had a Slight Risk out from southern KS through much of OK and into northern TX with a 5% tornado risk (all outlooks below). The setup by the afternoon included a 1007 mb surface low near Childress, TX with a moisture axis extending northward through western OK where dewpoints were in the upper 60s. Strong instability developed ahead of surface low with 3,000-4,500 j/kg of MLCAPE building into much of OK. In the upper levels, there was northwest flow at 500 mb with a weak area of vorticity caught in the flow that would help be the trigger for convection. 0-6 km shear of 35-45 kts with strong directional shear from 1-4 km indicated an environment favorable for supercells and an isolated tornado threat, while steep mid level lapse rates would bring a risk for very large hail. 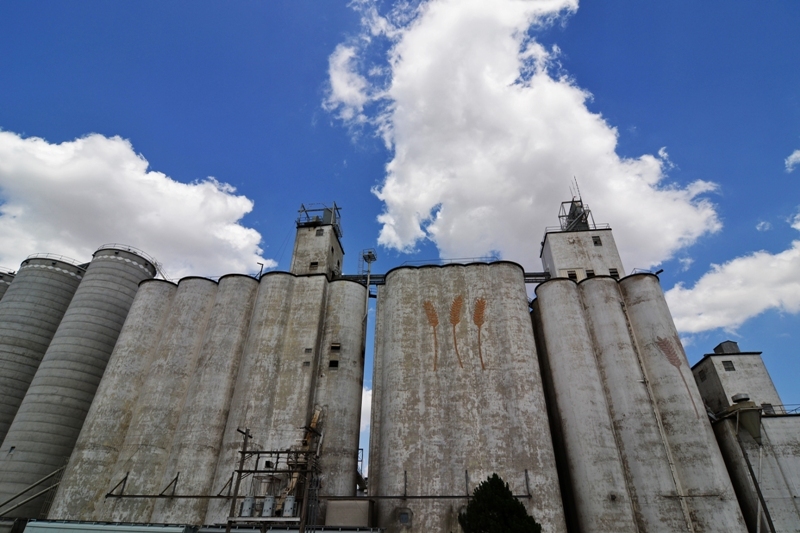 We progressed north to Watonga, OK on Hwy 281, sat for a while to watch the developing cumulus field, and then decided to head further north on Hwy 51A to Fairview. Along the way, SPC issued a Mesoscale Discussion at 3:06pm for the area and a Severe Thunderstorm Watch at 3:55pm, valid until 11:00pm for most of western OK. 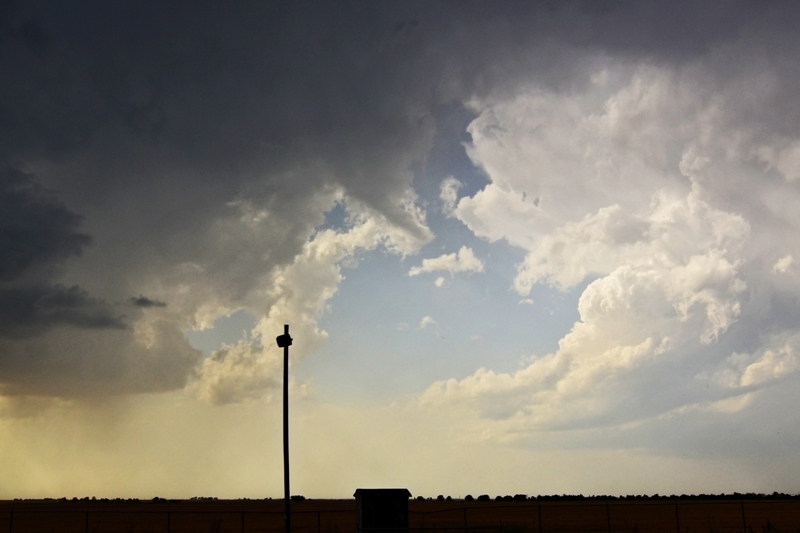 The cumulus quickly turned into towers going up from near the KS border to northwest TX and one developing storm soon caught our eye near Isabella. This initial storm was struggling at first to get going and remained very LP as we got closer to Okeene, but took on incredible structure as the storm base and updraft were twisting like a corkscrew and took on a barber pole look. At this point near Okeene, we continued to remain on the southeast part of the storm, which allowed for great structure shots, but the storm started firing cg’s like crazy and we were forced into the vans. The lightning even caused numerous fires in the dry wheat fields in the area! 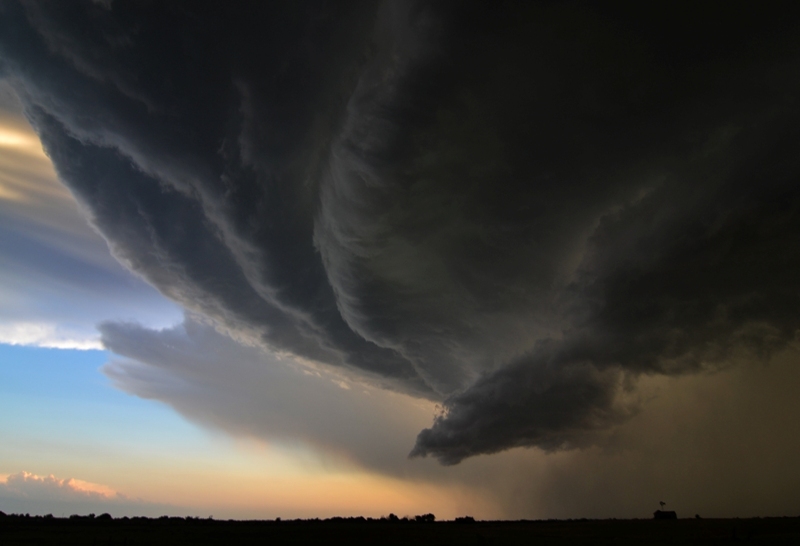 Upon reaching a point near Hennessey, the storm began taking on more classic supercell characteristics and was spinning like a top, while a rotating wall cloud formed under the base. I thought for sure that this storm would drop a tornado here, but it never could get its balance down right. We drove towards Kingfisher on Hwy 81 and waited on a hill on the south part of town as the supercell began taking on more of an HP look and barreled towards the town. The supercell had several mesocyclones and a few wall clouds as it moved near and over Kingfisher…kind of a scary moment where it looked like it might drop one on the town. We were in danger of being cut off from this storm as we continued south to Okarche and then east towards Piedmont, stopping a few times along the way to take pictures of the amazing storm structure. The storm took on striations with a tentacle look to the inflow bands as they wrapped completely around the storm’s mesocyclone, while a bowl shaped lowering formed as we stopped and watched near Piedmont. 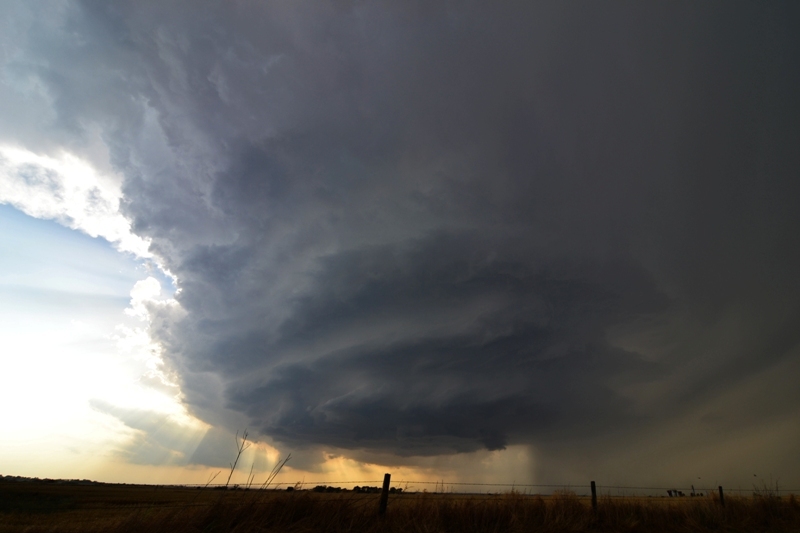 This was the third time in the day that I thought I may have seen the best supercell structure in my life! As a left-moving storm came up from the south, the gust front interacted with our storm and this was enough to produce a tornado at 8:28pm, which lasted for a few minutes. The tornado itself was kind of hard to see due to being rain-wrapped, but it was certainly there and reported by several other chasers. Right after producing the tornado, the storm really began to gust out and become a squall line as several storms congealed. We raced to the south out ahead and west on I-40 towards El Reno and south on Hwy 81. Near the Canadian River we saw a huge dust plume that looked to be RFD or strong outflow kicking around/ahead of the west side of the developing squall line, and this was (falsely) reported as a tornado at that time. However, it did look interesting between the lightning flashes as it was becoming dark and even we questioned if it could be a tornado for a brief moment. After getting ahead of the squall line and seeing the shelf cloud, we punched back north through the rain, wind, and small hail to get back to our hotel in Oklahoma City for the night. It was interesting when we got back, as this area had been pounded by high winds and baseball sized hail with the storms we were chasing all day. There was quite a bit of noticeable damage to vehicles, signs, and trees as a result, as well as some good stories from the hotel staff and guest. Cumulus above grain elevator in Watonga, OK.
Twisting and intense updraft with low precipitation supercell near Okeene, OK.
Shear funnel on supercell near Okeene, OK.
Low precipitation supercell becoming more intense with larger base between Okeene and Hennessey, OK.
Storm becoming even better structured with striations and intense updraft near Hennessey, OK. Possibly a funnel on the right side of the base? Incredibly structured, striated and intense supercell near Hennessey, OK. One of the best I have ever seen! Supercell getting more of that "wall cloud" look under the base. Almost produced a tornado at this point. Rapid condensation and some rotation with this lowering as it was coming right at us. In front of the storm as it was close to producing. More of a classic supercell with lots of rotation and motion in this base over Kingfisher, OK.
One of the best supercells that I have ever seen! This was near Piedmont, OK shortly before producing the tornado. 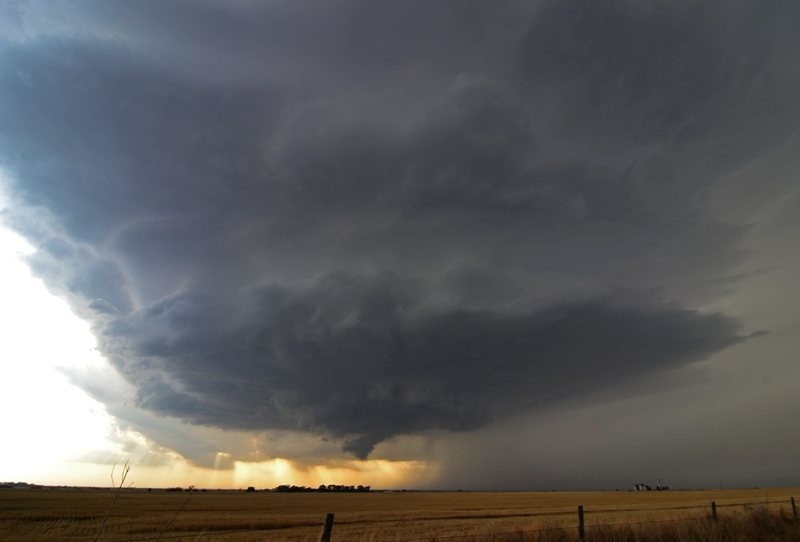 Notice the inflow "tentacle" wrapping around the base of the storm, intense rain/hail core, and lowered bowl in the middle, indicating a tornado is close to forming. Another view of the amazing supercell a short while later as the inflow band was wrapping around. Still have that bowl lowering underneath. Left edge of supercell showing the thick, stacked plates look. Rain wrapped tornado near Piedmont, OK. If you look close, you can see the debris fan. Closer view of the tornado from the previous photo. 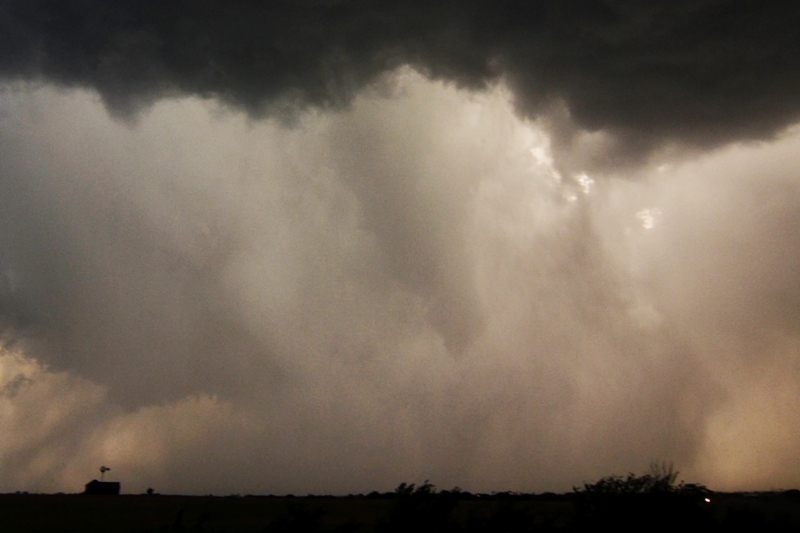 Rain wrapped tornado in the middle as it was close to lifting near Piedmont, OK.